A boutique hotel housed in a traditional inn dating back to the fourteenth century, it is said that Queen Elizabeth I visited the property in 1573. 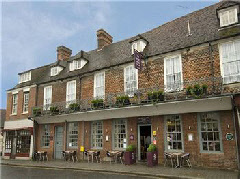 The George offers a bar and brasserie and a total of twelve individually styled rooms. Eight of these are located in the older part of the building and include a fine four poster suite (the Crimson room). Perfectly located for those seeking to visit the famous towns of Kent, Tunbridge Wells, Ashford, Tonbridge and Canterbury are all within easy reach by car.